My 13 year-old son lives and breathes football. He plays for two football teams, he supports Arsenal, he watches football on TV, he reads about football, he plays FIFA on his Xbox, he practices football wherever he can, he talks about football teams and footballers to whoever will listen and he probably even dreams about football. I have only a passing understanding of football, but my son’s passion for the sport means that I know more about it than I’d ever have expected to, I help to run his club team and I look out for football-related experiences on our travels. So when Enjoy Staffordshire invited us to review the Hilton at St. George’s Park, I knew that we’d accept. St. George’s Park is near to Burton upon Trent, approximately in the centre of England, and is the English Football Association’s National Football Centre. It’s where the 24 England football teams train, and the Hilton is where they stay when they’re training. My husband, son and I arrive at the hotel at 5pm on a summer afternoon. It’s a huge, modern building, set in 330 acres of rolling countryside. My first impression is that, apart from the football pitches all around the building, it feels like any other stylish, modern, luxury hotel. But that’s inaccurate – I gradually realise that it’s a place with football at its heart. As we make our way to our second-floor room – number 245 – we pass photos of football heroes on the walls. 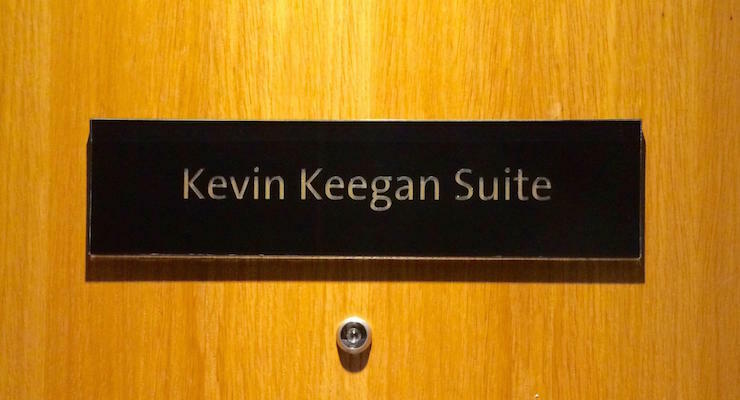 We reach our door and I see that our room has a name: it’s the Kevin Keegan Suite. I remember Kevin Keegan as the star player with fashionably curly long hair in the 1970s. Along the corridor we see that there are some other rooms with names – the Glen Hoddle Suite is next door. I wonder who chose the suite names and what criteria they used to choose them? Our room is a spacious one-bedroom suite, and is perfect for us. There’s a large double room with an en-suite bathroom, and a separate living area with a cloakroom. There are sliding wooden doors between the bedroom and the living area, and there’s a sofa bed which has been made up for our son. The decor is neutral, and there’s a picture of Kevin Keegan on the wall above the sofa bed. From our windows we see nothing but green countryside and woodland. The room is very well-equipped and comfortable. I find a kettle and tea and coffee things tucked away on a tray in a drawer. We watch snatches of the Olympics on the two big TVs. In the bathrooms my son is excited to discover that there are speakers which are linked to the TVs. There’s free wifi available throughout the hotel, although the service is a little patchy in our room. 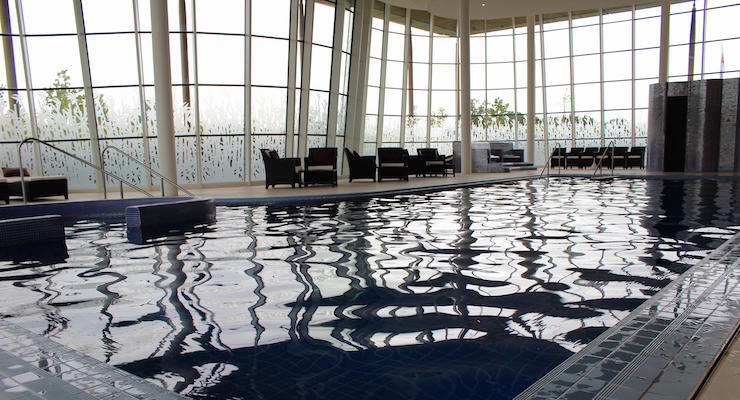 The hotel has a good spa with a gym, an indoor swimming pool, a steam room, a sauna, juice bar and treatment rooms. I swim in the pool one morning, and have the whole place to myself. There are plenty of chairs and loungers around the pool, which is good to see. 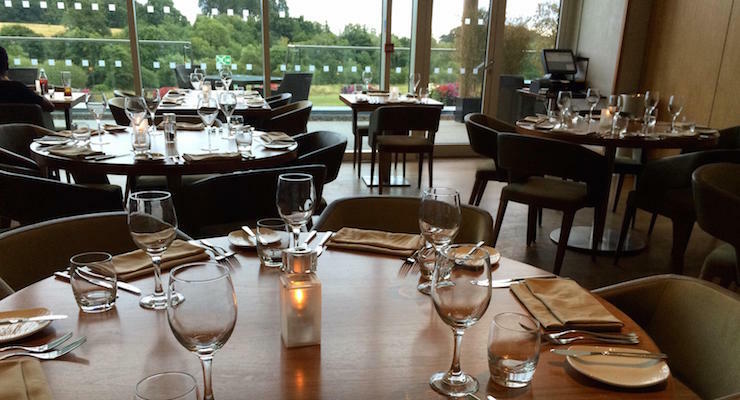 We have breakfast and dinner at the hotel’s airy restaurant, which has full height windows with views of the surrounding countryside. For dinner I choose a vegetarian platter and then chickpea curry, and it’s all very tasty. The service is great. The next morning at breakfast there are lots of men and boys in football kit around. My son plays it cool, but he notices a player who’s ‘on FIFA’, and then asks me to find out which teams are staying at the hotel. The receptionist isn’t sure, but he says that the Barcelona team were here a couple of weeks ago with Messi, and the Qatar U17 team is staying here now. There’s a bar area next to the restaurant – the Cross Bar has comfortable seating and a huge screen showing sport. Outside the bar is a display area with football memorabilia. Above reception, on the first floor, is the Centre Circle, with a small Starbucks outlet which never seems busy. The England players stay in a part of the hotel which is separated from the public areas. We glimpse it from reception – above us is the England Lounge, a large private balcony area with seating. 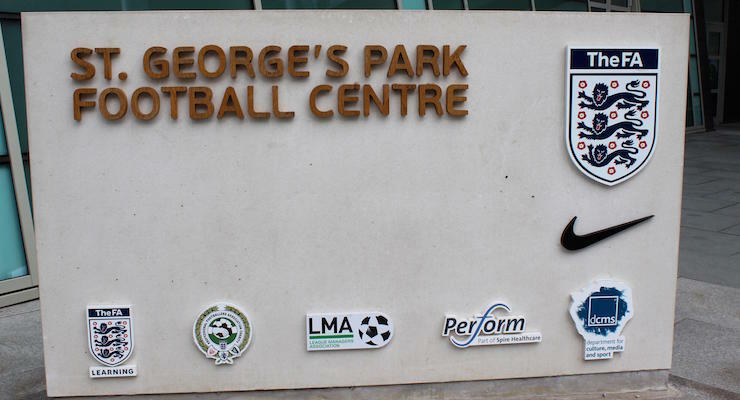 We take a group tour of St. George’s Park National Football Centre while we’re staying at the hotel. The tours are open to anyone, even if you’re not staying a hotel guest. The tour starts in the hotel reception, where a guide meets us. He leads us to the indoor 3G pitch which is used for professional games. We’re allowed to walk on the pitch to take photos. Next it’s the outdoor replica Wembley pitch, which we’re definitely not allowed to walk on, the gym, changing rooms, autograph wall and more. We see some players in wheelchairs practicing Futsal in one of the indoor halls. The purpose-built centre was opened in 2012, and its facilities are world class. 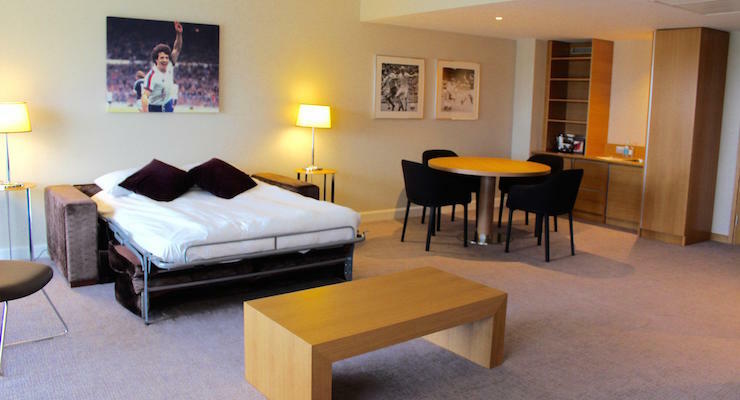 Rooms at the Hilton at St. George’s Park cost from £69 per night, depending on dates and availability. Hilton say that guests get the best rates by booking direct with them. 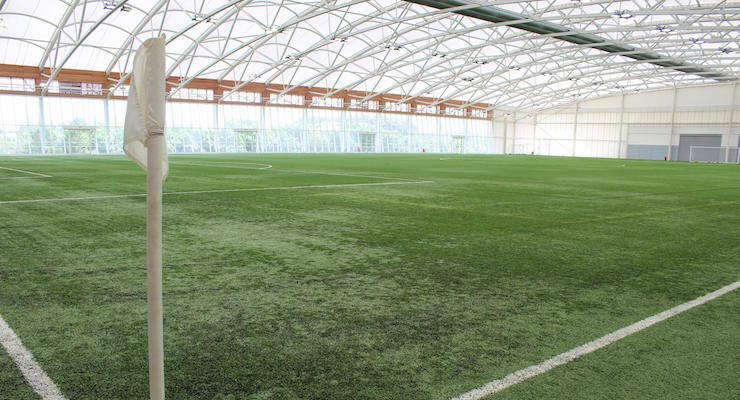 Tours of St. George’s Park cost £9 per person, and need to be booked in advance. 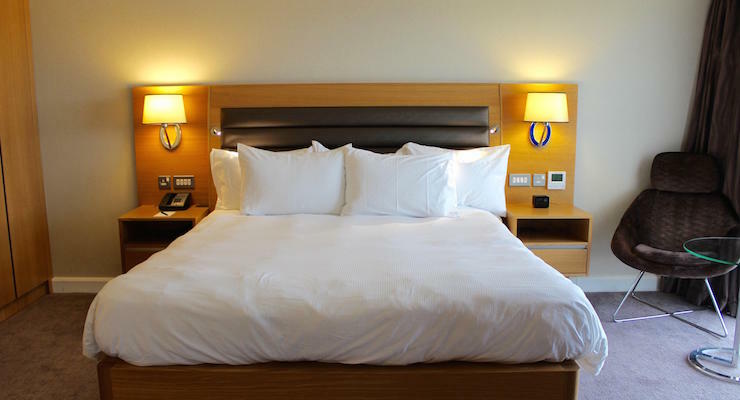 I like the hotel, it’s comfortable and well-designed and the staff are very helpful. The pool and spa area are very good. We all enjoyed eating at the hotel restaurant. The tour wasn’t that interesting for me personally, but I’m glad that our son had the chance to go on it. Disclosure: This post contains affiliate links, which means that if you clicked through and booked I may receive a small commission. All opinions, images and words are my own, as ever. 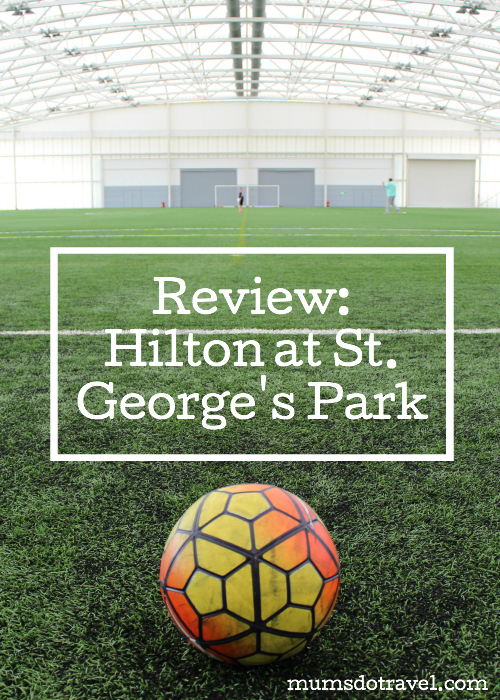 Our two-night stay at the Hilton St. George’s Park and tour of St. George’s Park were provided for the purposes of this review. Our trip was arranged by enjoy Staffordshire. I’m not a huge football fan either but this sounds like the perfect place to stay for anyone who is. Definitely – and it’s a good hotel, even if you’re not into football. You’d all love it there Sarah! nicola baird recently posted…How can I still go on an adventure? Thanks Nicola! I need to look around the Emirates stadium – my son wants to do that with me, as he’s already done it with my husband – and the Legends Tour sounds great. Are you West Ham fans then? What a lovely experience for your son! What's it like to stay at La Manga Club?